Click here to learn more about SyncSummit LA and attend next week on December 4-5. Epic Music LA and SyncSummit, Hosts of the First Annual Sports Music Awards, taking place on Tuesday, December 5th at the Bardot Hollywood, will honor football great Rosey Grier for his outstanding contributions to football, music, and culture by presenting him with the first Sports Music Legends Award. Los Angeles, CA, Dec 1, 2017 – The industry leader in providing original music for sports and media, Epic Music LA, and SyncSummit, the world’s premier event for branding, music and media, are honored to announce they will present the first Sports Music Legends Award to the celebrated football great, singer, actor, minister, philanthropist, inspirational speaker, and activist Rosey Grier at the First Annual Sports Music Awards on Tuesday, December 5, 2017, at Bardot in Hollywood, California. Roosevelt “Rosey” Grier is an American Legend. As a football player, his professional career began when he was drafted by the New York Giants in 1955 after playing on the defensive line at his alma mater, Penn State. During his time with the Giants, Rosey led them to an NFL Championship in 1956 and the Eastern Conference Championship in 1958, 1959, 1961, and 1962. Rosey was named All-Pro as defensive tackle in 1956, 1958-1962.In 1962, he was traded to the Los Angeles Rams, where he joined the “Fearsome Foursome” along with Deacon Jones, Merlin Olsen, and Lamar Lundy, who together were considered one of the best defensive lines in football history. After an Achilles tendon injury in 1967, Rosey retired from football. If Rosey’s professional story ended there, he’s have already secured his place in sports history as a football great, but where his story in football ends is where his story as an American legend truly begins. A true polymath, Rosey’s life has become legendary. 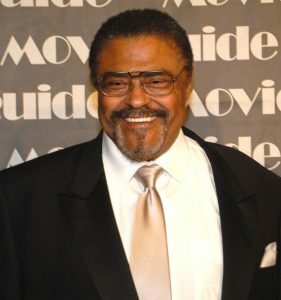 He hosted a local community affair show in LA called The Rosey Grier Show. He was the bodyguard for his friend Senator Robert F. Kennedy during his 1968 election campaign and actually wrenched the gun away from the assassin Sirhan Sirhan.He starred in over 70 TV shows, numerous films, and from the 1960’s onward, put out an amazing body of work as a musician and singer, including great singles like the soulful “You’re the Violin” and the 1968 tribute “People Make the World,” in remembrance of his slain friend Robert Kennedy. But there’s still more to Rosey, much more. In the 1970s, he was an advocate for the hobbies of needlepoint and macramé, was ordained as a Protestant minister, wrote a number of books, was on the Milken Family Foundation board of trustees serving as its program administrator of community affairs, was the co-founder of the American Neighborhood Enterprises charity, was a featured speaker at the 1984 Republican National Convention, and is the father of three children and husband to Cydnee Seyler. The Sports Music Awards will recognize the achievements of musicians, athletes, music supervisors, managers, producers, creative directors, songwriters, brand, and agency executives as well as those working in the fields of brand and interactive media. The Awards are comprised of 6 categories designed to acknowledge those who make original music and license music for visual, interactive media, branded entertainment, and advertising across television, film, games, mobile, and the internet. Tickets to the ceremony are $100 and included in admission for all SyncSummit LA attendees. Epic Music LA is a music licensing and publishing company based in Los Angeles. We provide highly curated music of all kinds and genres for visual productions in TV, Film, Trailers, Promos, Advertising Agencies, Gaming, and Corporate outlets. SyncSummit is a company that produces events, market research, podcasts and consulting services that serve people who make and use music for TV, film, games, interactive and advertising. Our high-level, focused networking events are held in New York, Hollywood, Asia, South America and Europe, gathering top music supervisors, heads of music in visual and interactive media (TV, Film, Video Games, Advertising, the Internet and Mobile), label executives, publishers, music libraries, composers, artists, technologists, legal, accounting, brand managers and service providers gather for two days of discussion, networking and deal making. For more information, please visit http://syncsummit.com.